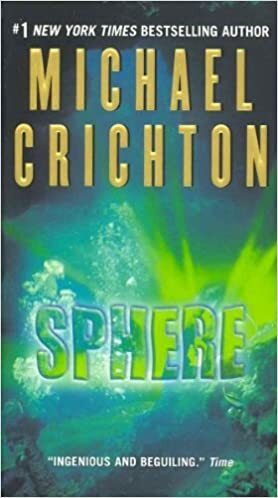 I finished Sphere by Michael Crichton a few days ago and honestly, I don’t have much to say about it. It’s better than a lot of the stuff that I’ve read recently but it won’t linger in my brain. I’ll give a little description and then dive into it. Basically, the military finds a weird spaceship thing in the ocean that looks brand-spanking-new (what a dumb phrase) and they call together a team of ten people from different backgrounds to investigate it. The main character, Norman Johnson, a psychologist goes underwater for a prolonged period to study this anomaly and then some strange stuff happens. All of the reviews on the book praise it for being full of suspense and a page turner. I agree with that… mostly. It starts off and they go down in an underwater habitat to research and study a UFO, then they realize that it’s an American spaceship, then they realize that it’s an American spaceship from the future, then they realize that there’s an alien object (sphere) on the spaceship, then one of the members of the team enters the sphere and wildlife like giant squids and jellyfish start attacking their habitat, then the entity that they believe is inside the sphere starts to communicate with the crew via english and names itself Jerry, then half of the crew gets killed by the giant squid which they believe was created by the alien sphere, then they make a discovery that the crew member who entered the sphere is actually the one manifesting the squid using his subconscious fear of the ocean, then they have to try to subdue the crew member because if he remains scared then the squid will come back and attack the rest of them, then another crew member enters the sphere, then Norman enters the sphere to manifest his own fears so that he can stop the other two from manifesting their own, then they end up going back to the surface and with there new infinite manifesting power, they force themselves to forget about the whole experience. He tried to get a cliffhanger but I don’t buy it. If that sounds like a good time, then by all means, read the book. It’s a fun ride, but constant suspense starts to wear off when something new happens every five pages and proves that the ideas that they had for the last four were all wrong from the start. The ending was kinda bland but I did like reading it. I’ll read more of his work in the future, but if they’re all this erratic, then I might not make him a regular.